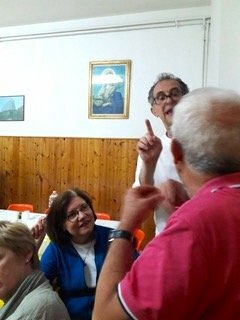 Having spent two weeks in Agnone in June (2018), I can say that the “Live and Learn Italian” program really lived up to its name. Weekday mornings were spent in stimulating classes, learning Italian grammar points and engaging in interesting Italian conversation, all in a very open and relaxed atmosphere, thanks to our teachers Filomena and Alessandro. What we learned in class helped us later when we had the opportunity to listen to talks in Italian, ask questions of the lecturer, and participate in conversations with our B&B hosts and the other Italians with whom we had contact. There were plenty of “Live and Learn Italian” activities. 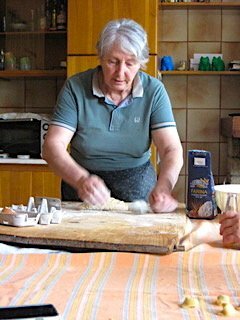 For example – and this is just a short list - our cooking lesson in Maria’s home had us all involved making ravioli, Italian empanadas and two fruit crostatas at Maria’s direction, and then enjoying our labours with lively conversation with her and her husband around their dining room table; the visit to the nearby archeological site at Pietrabbondante of the ancient Sanniti people (Samnites in English) featured a lecture at the site by the historian Nicola Mastronardi who has written books on the Sanniti; and the visit to the famous Marinelli bell foundry included a guided tour of the museum, an explanation of how a bell is actually made, plus a demonstration of the beautiful bell sounds by their bell ringer. 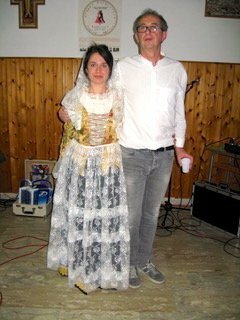 The highlight for me, however, was the evening spent with I Dragoni, the local folk dance troupe, a group of about 30 people, some multi-generational, aged 6 to adult, who performed dances for us with such enthusiasm that it seemed the music totally transformed them. 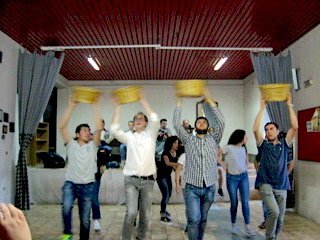 I was struck by the number of teenaged boys in the group, three of whom played the Organetto (small accordion), which along with the tambourines and guitar, propelled the dancers in their fast-moving steps. After the dance performance, we were invited as honoured guests to join them for dinner with music in the adjacent hall. I had the pleasure of sitting next to Bruno, one of the principal adult dancers, who explained the stories of some of the dances they performed. One, which was fun to watch, centred around boys and girls sneaking flirtations and kisses during the Vendemmia out of sight of their parents; at the time, the only way boys and girls could meet. 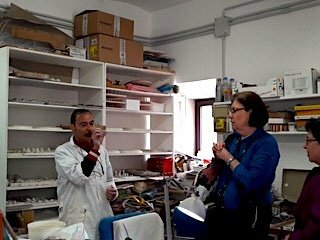 In discussing costumes, which the dancers didn’t wear that night, I mentioned our visit to the museum in Isernia to see traditional Molisani costumes and jewellery and how we had marvelled at the beautiful handiwork. Bruno said he had his grandmother’s costume at home, so off he dashed to get it, and when he returned, one of the dancers put it on and paraded into the hall to model it! Bruno explained its history and the details of its handiwork. The entire hall of people was in awe with many phones snapping photos. He said it was the first time he took the costume out in public. 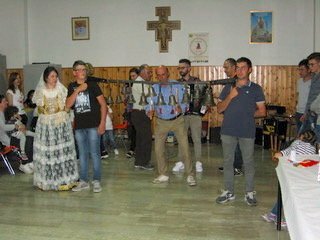 It was quite a special moment for everyone and, for me, of Molisana heritage, to experience the strong pride these Molisani have for their traditional culture was an unforgettable highlight of my time in Agnone. Thank you Barbara for sharing your impressions, and delighted you enjoyed the local folk dance troupe so much. You can read all about our guests experiences in our testimonials here.